Reviews and discussion of various topics, including books, comics, movies, and the odd social issue. Updated whenever the heck I want. We all know that Batman's crazy prepared. When I say "crazy prepared," I mean he's the kind of guy who would make a plan to unite all of Gotham City's gang leaders under one guy who was actually under his control. This may sound like the sort of plan he'd pull off without hesitation, but he'd apparently kept it in reserve, because, let's face it, it's a pretty stupid plan. Lots of unpredictable variables, any number of things could go wrong, not to mention all the fighting and dying that could happen if one little hair was out of place. What? He actually made that plan? Wow. Enter Stephanie Brown, a.k.a. the Spoiler. Steph, recently fired from being Robin, decides to try to win back Batman's approval by enacting one of his long range plans to unite all of Gotham City's gang leaders under one man. Unfortunately, when all the said leaders are in one place, things go wrong, there's a shootout, and everybody dies. Spoiler and Catwoman witness the whole thing. This is turn leads to a gang war as the various organized crime factions of Gotham City start fighting each other. Batman, Robin (Tim Drake, eventually back to his old job), Batgirl (Cassandra Cain), Nightwing, Oracle, Orpheus, Onyx, and Tarantula attempt to save the plan by getting all of the warring gangs to unite under Orpheus. Meanwhile, Spoiler is still on her own, and there's a sinister hand at work in the midst of all the chaos, waiting for the perfect moment to slip in and hijack Batman's gambit. Okay, I'll be honest. This storyline is a mess. Everything about it is chaotic and frenetic. From the War Drums arc which tells us a few decent stories taking place before the main action with War Games starts to the craptastic War Crimes, this storyline is one house of straw built on top of another. A straw apartment block, I guess. The plot snowballs out of control from the moment you flip the first page of Batman: War Games, Act 1: Outbreak, until it coalesces into the hideously arranged and paced story I've ever read. To be fair, War Drums wasn't all that terrible. It had a few nice stories featuring Dr. Leslie Thompkins and Stephanie Brown as Robin in a few issues from Bill Willingham's run on Robin. I always liked the Robin series, and I'd like to someday read the earlier, uncollected issues (yay Comixology!) from Chuck Dixon's original run. It collected another story involving Tarantula, which was pretty decent, and overall a fine detective story. The one good thing about this particular Bat-family crossover is that it dealt with Gotham's organized crime scene, and focused on Batman's activities as a detective. That's the sort of thing that I don't think is focused on enough in the Bat-books these days. Furthermore, I really liked the Stephanie Brown as Robin stories, and I loved the dynamic that was presented there. Stephanie Brown is defined by being a chipper, never-say-die, enthusiastic type, and that hugely contrasts with Batman's grim and gritty, super serious demeanor. It's just so fun to watch that you can't help but cheer for Steph and feel down and dour when Bats fires her at the end of the trade. However, War Games -all three dadblamed volumes of it- is nothing like this. I already explained what I hated about it, but now I'm going to elaborate. The key problem with War Games is that it's stretched and dragged out so much that it all becomes one big slosh of blandness and stagnancy. It wouldn't be so bad if it there was actually one writer and one consistent story going on. Like all Bat-family crossovers, it has a whole bunch of different books cobbled together into an attempt at telling a single, unified, coherent story. Instead, we've got a bunch of disconnected plot lines featuring everyone from Batman to Commissioner Atkins to a bunch of newscasters to Catwoman. Not even Ed Brubaker's writing with Catwoman can save her portion of the story. Indeed, it's one of the most extraneous portions of the tale, which is ironic because one important piece of plot information is dispensed in one of the issues. I won't even hide it because we're talking a ten-year old spoiler in a comic series that filled Bat-fans with headaches for years to come. Batman's plan required the presence of a gangster called Matches Malone, but Stephanie didn't know that Malone is actually a cover identity for Batman. Thus, War Games. I can only imagine how frustrating it was for people reading these stories in their original comic book form back in 2004 and 2005. They'd have to jump from Detective Comics to Batman to Catwoman to Robin, back to Batman and maybe to Legends of the Dark Knight, yadda yadda yadda. Well, news flash: mashing it all together in book form doesn't solve any problems other than making it easier to be more confused. As far as I'm concerned, the only good stories in these three volumes are the Robin issues, which manage, against all odds, to harness the energy of the event and capitalize on being caught up in such a chaotic situation to drive the story to step above mediocrity. But none of my complaints can measure up to how unspeakably awful War Crimes was. I'd almost say that Andersen Gabrych, the main writer of this whole entire travesty, committed war crimes by writing War Crimes. The basic premise of War Crimes is that Stephanie Brown's (Spoiler, no pun intended) death (spoiler: it was actually faked), her medical records have disappeared, leading to Batman setting off to find out what's what. Along the way, we hear some of the worst dialogue I've ever read, stupid plot logic, and the worst and most nonsensical reveal in the history of comics. Batman actually says something like, "It's good to dust off the old detective skills." As if he didn't know that he was the World's Greatest Detective. Black Mask (he was the main villain who profited from the whole War Games fiasco to become premier crime lord of Gotham) is rendered into a cartoonishly bland thug, with none of the savvy sarcasm that made me like him so much under Judd Winick's pen in Batman: Under the Hood. In fact, every character in this story is portrayed all wrong, from Batman to that Hispanic newscaster guy who was actually a jerkhole. The main point of War Crimes was to distract the fan-base of Stephanie Brown's "death" by saying, "Oh, she didn't die from torture from a sadistic killer. She died from lack of treatment from an up-until-now saintly doctor." I think that this is easily DC's equivalent to Marvel's One More Day, except that War Crimes has the dubious honor of having been retconned out of relevancy a long time ago. 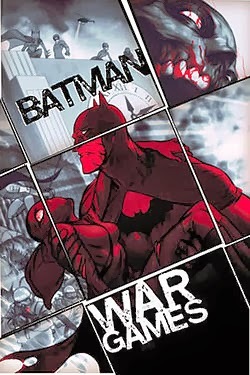 Batman: War Drums/War Games/War Crimes is without a doubt one of the worst Bat-family crossovers I have ever read. There were actually a lot of such crossovers in the 90's and early 2000's (such as Knightfall, No Man's Land, and Bruce Wayne: Murder/Fugitive? ), all of varying degrees of quality, War Games being the last in a long line. I have a mind to read them as well, once I get to them. I read most of Knightfall, and it was pretty decent, though suffering from the same key problem as all Bat-family crossovers, but to a lesser extent (I say most because the Knightquest portion had not yet been collected). My point, however, is that among Bat-family crossovers, War Games is a classic example of how not to do it. Besides from being confused and rambling, it was, above all things, boring. Which is really sad, because there's a crud-ton of action in here, and let me tell you, it doesn't let up. Bottom line, check out War Drums, which is fine enough, only read War Games if you really want to, and I'd only send you there for the Robin issues, which are only collected in those three accursed volumes. Avoid War Crimes completely. Just take my word for it. For a (slightly) better take on the War Games arc, check out Gotham Central: Book 3: On the Freak Beat, which has a story which takes place in the aftermath of War Games, technically placing it during War Crimes, but without any connection to that... thing. Divergence and Daredevil at Primary Ignition!